Jesus Christ is risen today! Alleluia! Early in the morning of the third day, women go to the tomb and find the stone at the entrance has been rolled away. An angel tells them Jesus is alive. Easter Day dawns, and Jesus appears to his followers. We celebrate joyously the resurrection of our Savior. 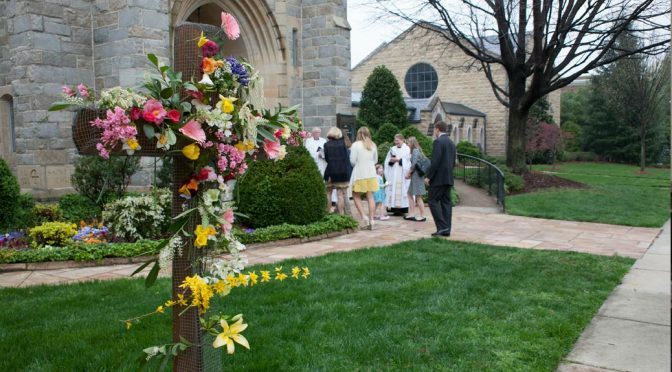 Parishioners of all ages are invited to flower the cross in front of the church before and after services. Child care will be provided for infants through three-year-olds in rooms 107 and 114 during the 9:00 and 11:15 a.m. services. Incense will be used at the 11:15 a.m. service.